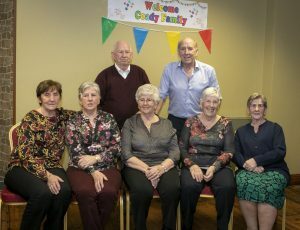 FAMILY gatherings usually consist of a get together at one person’s house, but for the Coady family the Mount Sion Centre was just about big enough to cater for the 250 plus members. Held on Saturday, March 30, the family gathering was the who’s who of the Coady’s in Waterford, and full of fun, laughter and endless stories of times gone by. Members of the Rock Quarry Road, Gracedieu, Ard na Greine, Canon Street, Green Street, and the twin Coadys travelled to the event to share in the fun and frolics. The Coady’s family tree goes back to Michael Coady, from Butcher’s Lane, and his wife Kathleen Doherty, who between them had 16 children, the first of which Nicholas came along in May 1928. William, Michael, Mary, Joseph, John, Kathleen, Ellen, Peter, Elizabeth, Josephine, Patrick, Veronica, Noelene, Martin and Thomas followed in the intervening years. The family were reared at Quarry Road, Gracedieu. They were self-sufficient and grew their own vegetables. Many would remember Granny Coady sitting on a bench and sharing stories with passers-by. Coady’s pond is still named in the family’s honour. The Coady family from Gracedieu. Most of the Coady family worked in the Foundry at some stage in their lives and the family name was also strongly associated with hurling. They are proud of the fact that Joe was one of the players on the winning all-Ireland Waterford team in 1959. One of Mary’s grandchildren said, “Paddy was the reason I started following hurling, bringing me to matches. Family members can be normally found in the old ground watching Waterford play. Between them the Coady siblings went on to have 80 children by the time Kathleen passed away. To mark the 30 years since Kathleen’s passing the gathering was organised, with the remaining eight siblings in attendance. Helen Millea, one of twin daughters of Ellen, said that in previous years the family attended dinner dances in the Tower Hotel, but decided to host a full gathering in the Mount Sion Centre. Despite the extensive size of the Coady family they are all close. Helen remarked that a clear resemblance could be seen between the members at the party. They danced the night away to their favourite music, which was topped off by the Coady’s getting down on the floor for rock the boat. Helen said a great night was had by all. The poem we reproduce below hangs in the Coady family home and perfectly captures the pride of being part of one of the largest extended families in Waterford. A few kids we will have. Now a sister for Mary would be very nice. Then John, Eily, Peter and Betty made 10. Strengthen the crew and this they did do. Everyone thought there won’t be anymore. Didn’t suit Mother as we all know. One to marry out of the old place.